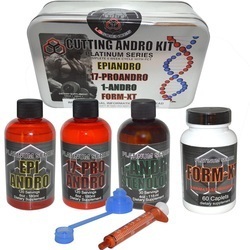 The CUTTING ANDRO kit is our best combination of andro supplements that we believe will give you every advantage during your cutting phase. EPIANDRO is a andro supplement to stanolone that may increase aggression and give you insane hardness in the gym. 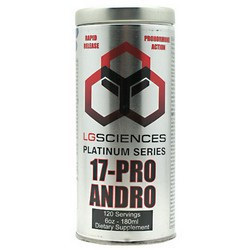 1-Andro is a perfect addition to your andro supplement cycle. This dry andro supplement is one that people love for the intense hardening and strength assisting effects. 1) There is effectively no liver toxicity with legal andro supplements. 2) All claims are dependent on proper diet and exercise. 3) All andro supplement products have the possibility of side effects, but they are rare (read the warning on the bottle for a full description). 4) andro supplements should only be taken by people over 21 unless with a doctor’s supervision. OK now you know a little about the Cutting kit from LG. What’s nice about this kit is that it’s not a Methyl. Which means it’s not harsh on your body. I have also found this kit not to shut you down near as much as others. Making PCT that much easier. Running the PCT like Form-XT should be all you need, but many like to stack a Natty test booster with that. That’s fine. One could also use HCGenerate ES from Needtobuildmuscle during cycle and throughout PCT instead of a Natty test booster. These aren’t needed, but can add to a successful cycle. For a PH cycle like this I would recommend a 5 day a week .High Volume and Intense workout. I have a workout routine already laid out for you. This isn’t for the faint of heart either and I’d recommend you run it for a couple of weeks and figure your weight settings and adjust it a little to fit you better. You may not like every exercise I have chosen or amount of Sets. I’ve done well off 4x10-12 for must things… Some do great off just 3 sets. While on a PH Cycle you are able to push things harder and longer. So don’t be afraid of a little Volume. Once you have ran this routine for a couple of weeks and feel comfortable with it. Start your Cutting Kit. How I run my routines. I do a lot of Super Settings, Rest-Pause and FST-7 sets. Most of you should know what a Super Set is. If not, Google it. But I’ll help out on the FST-7 and Rest-Pause sets. The FST-7 is a basically a Giant set. Its 7 sets to Failure, but you want to fail on 12…. So Say we are doing Cable Rows with 200lbs for the first set. I get 13 reps. I’ll stay are 200lbs for my 2nd set and get 11. So, on my 3rd I would need to drop the weight by 5-10lbs. So I could get 12 reps. The goal is to adjust the weight for each set to fail around 12. These sets have only a 30-45sec rest periods between them. So it doesn’t take long. Everything is laid out below. AB’s are done twice a week, but are not listed below. I would normally do these at home. If you want to do them while at the gym. I’d suggest doing them on Shoulders or Arm Days. These Days are the quickest days. Once warmed up none of these workouts should last past 45min. Shoulders and Arms can be done around 30mins. Leaving time for AB’s. Like, I stated before I like to hit them twice a week. Once with weights and once with body weight. In my opinion Cardio isn’t needed if your Diet is on point, but many need that cardio. So with this routine below. I would suggest Cardio be done for 20-30min after the workout everyday but Leg Day. For more fat burning, try adding a 20min fasted Cardio session first thing in the morning. This routine is a Two Week Cycle. After the 2nd, start all over, but this time try to beat yourself by either weight or Reps on the main lifts. Did I mention you should be logging your workouts? Very important. Shake all liquid products before use - very important as it can settle. Take tablets with a small portion of food with fat. Liquids should be dispensed under the tongue, held for 60 seconds, then swished around the entire mouth, coating it before swallowing completely. 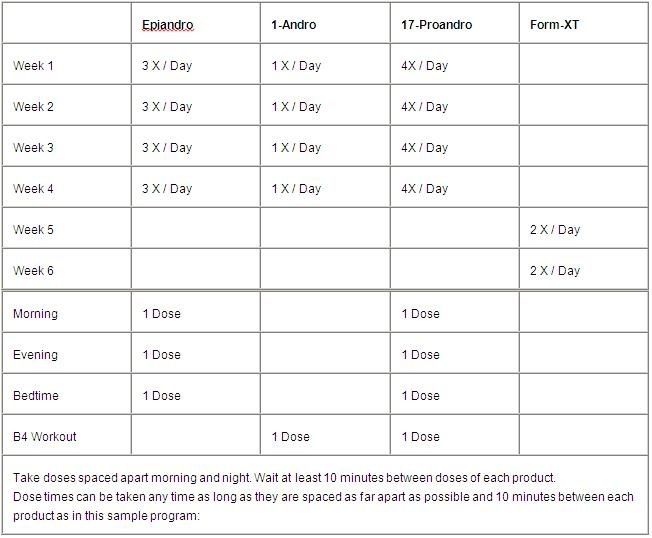 Take doses spaced apart morning and night. Wait at least 10 minutes between doses of each product.